Disneyland Measles Outbreak Spreads To 27 States. 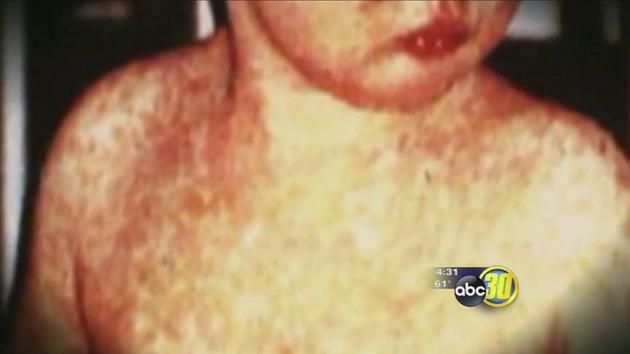 An outbreak of the measles that began at Disneyland just before Christmas is disrupting many lives across the country. 70 people have been diagnosed with measles, and hundreds more have been exposed at schools, doctors offices, hospitals, shopping malls and other places visited by infected patients. According to USA Today, Arizona became the latest state to report a case of the measles related to Disneyland when a woman in her 50s was diagnosed. The outbreak has spread Across the country including the states of Utah, Washington, Colorado, Oregon and across the border to Mexico. Hotspots for contracting the measles virus are mainly schools and hospitals. In California, two measles patients who visited the Oakland Medical Center’s outpatient clinic exposed 100 patients to the infection, says Stephen Parodi, director of hospital operations for Kaiser Permanente North California. In Colorado, health officials in El Paso County notified at least 250 people that they may have been exposed to measles at Penrose Hospital in Colorado Springs on January 3, when an infected patient showed up for treatment. Health officials in several California school districts told unvaccinated children to stay home after infected students showed up at school, says Gil Chavez, deputy director of the California Department of Public health. Those students include 24 at Huntington Beach high school. Measles can linger in the air, infecting people even two hours after a sick person has left the room. Parodi Says people who suspect they have the measles should not just show up at a clinic or hospital. Instead they need to call ahead, that way clinic staff can prepare to clear an area, minimizing the threat of spreading the illness. 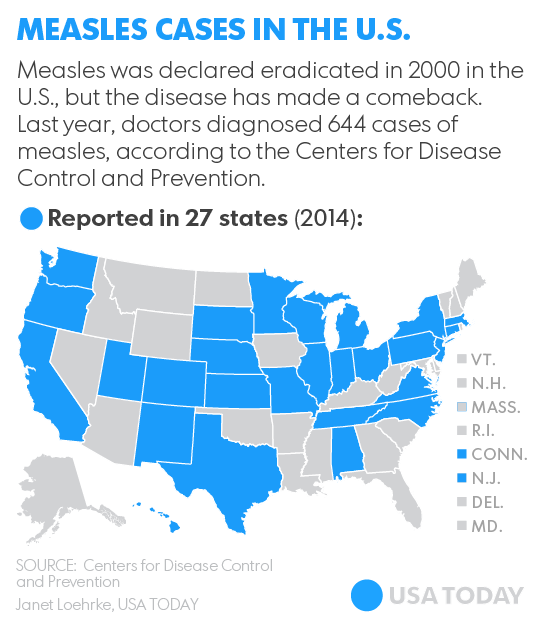 Measles were declared eradicated in 2000 in the US, because it was no longer spreading routinely like colds or the flu. However, the disease has made a comeback. Some blaming it on parents who refuse to get their children vaccinated. Some parents hesitate to vaccinate their children, believing that it is the cause of autism. Common symptoms include a fever, dry cough, runny nose, inflamed eyes and a telltale rash, according to the Mayo Clinic. Children are often so sensitive to light that they must be kept in a dark room. Children often developed ear infections and can develop both viral and bacterial pneumonia.